It was 1962… no smart phones, no apps, or computer generated maps. If you wanted to know where the sun was rising and setting, the only way to do it was with a slide rule and a book of solar tables. It was past midnight in Luxembourg when inventor James Kilburg was awoken by his wife’s phone call. There was some confusion, as it was just late morning in San Francisco. “There should be a world clock for this sort of thing,” he thought. Kilburg, who had invented the cigarette car lighter and the automatic dialing telephone, set to develop the first geographic chronometer he called the Geochron. Based on a Mercator projection of the Earth, this clock would show time simultaneously in all time zones, and the sun’s Event Horizon. Kilburg made a startup deal with Delta Airlines: he would invent, then make, a Geochron for each of their executive airport lounges, if they paid him up front. They agreed, and the Geochron was born. ...all coordinated with the Earth’s axial tilt and orbital position around the Sun. 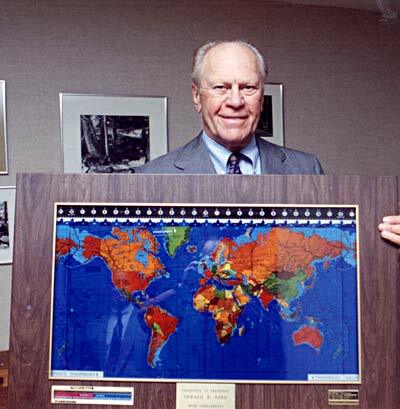 In its day, without computers, the Geochron was an elegant display of geospatial data; and the invention was quickly picked up by businesses for their conference rooms, or dignitaries as an example of American ingenuity. President Ronald Reagan asked for one, and FBI agents came to the factory in Redwood City, California to oversee the construction. At night, the agents would take the parts and pieces back to their hotel room for safe-keeping, and by the end of the week returned to Washington D.C. to install a very special Geochron in the Oval Office. That clock is now at President Reagan’s Presidential Library near Pasadena, California. So impressed by this beautiful machine, Reagan gave one as a diplomatic gift to Mikhail Gorbachev in 1987. The Geochron had other followers who were constantly tracking the Sun’s “Grey Line” – Ham Radio operators. That moment of twilight is the “Grey Line” between night and day. It creates a pathway for radio waves to travel the Earth… a very important detail to Ham Radio operators, and – before computers – only apparent through Kilburg’s Geochron world clock. In response to consumer demand, Geochron created Topographical and Ham Radio prefix maps. Over 30,000 Geochron clocks were made in Redwood City, including some for tech-heavy institutions such as the Jet Propulsion Laboratory, NASA, the European Space Agency, over a dozen for Boeing, and nearly 150 for the Pentagon. Using Mapping Specialists, Ltd. in Wisconsin, Geochron’s winding six foot long mapset is updated every five years or so. With no ability to update the mapset online, Geochron owners typically return their clocks to the factory for a change. Oddly, it is not the international borders that change so much, but the international time zones. At the turn of the Millennium, South Pacific island countries above the US Marshall Islands shifted their time zone to West of the International Date Line, essentially changing their local time by 25 hours into the future so they could be the first to greet the sun on January 1st, 2000. Across the Earth, time zone designations are made on the state or local level, so the map keeps getting reprinted, along with new Topographical and Ham Radio prefix mapsets. In 2006, Geochron moved from San Francisco to Portland, Oregon under new management. It was nearly the end of the clock because most of the craftsmen stayed in the San Francisco area, and the new company had trouble making this intricate, hand-built clock. When the Great Recession hit in 2008, it was only the owner’s generosity that kept the clock in production. For more information please visit http://Geochron.com. Editor's note: If you're in the Bay Area and would like to see a Geochron clock in person there is one on display in the Main Branch of the Alameda Free Library at 1550 Oak St., Alameda, CA.